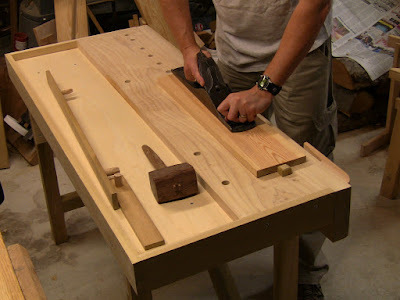 Now that the workbench has been built, here's how to use it. 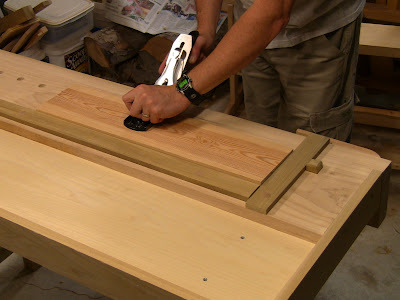 Most people are more familiar with a bench that has some kind of built-in vise. Instead, this one uses a variety of simple work-holding methods. The dog holes and thick front skirt make it quite versatile. I highly recommend the Gramercy Tools holdfast that you see here. It's good to have at least two. This is a modern version of an ancient design. There's a patent number on it; when I saw that, I wondered how you patent something that's centuries old, so I looked it up. The patent covers the manufacturing process for bending them from steel wire (that's not normally what I call "wire"!). Antique holdfasts were hand-forged by blacksmiths from wrought iron, which is ductile, so they have a bit of spring to them. It's that spring that makes them work as you bash them in with a mallet. Modern commercial holdfasts tend to be cast, and may be too stiff or crack. By using enormous gauge steel wire, Gramercy has produced a holdfast with good spring that can be manufactured using modern equipment. If you get one, wipe off any oil residue, then wrap some sandpaper around the shank and give it a few spins to roughen it slightly. The holdfast will grip tenaciously. I also highly recommend the Veritas Wonder Dog. 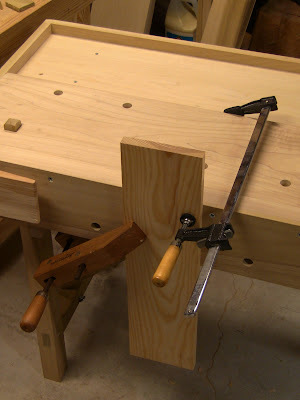 It makes a tail vise unnecessary, important in a portable bench. Back to the bench. First, let's take a look at the undercarriage to see how the cross-braces attach. 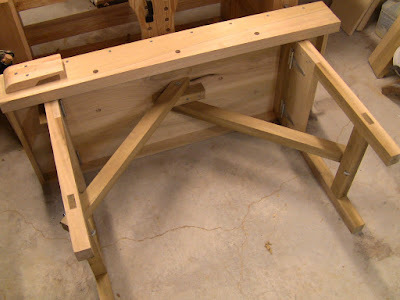 The braces bolt to a block under the top and swing down to the leg rails. This all goes together and comes apart in a minute or two. Next, let's process a large board into smaller parts. 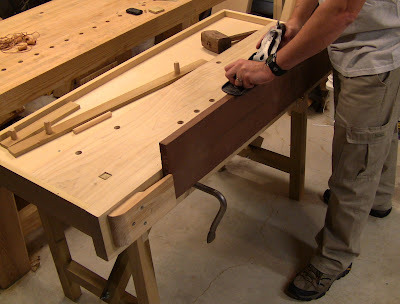 Breaking down a board is better done on a low sawbench at knee level, but it can be done easily on this bench if one isn't available. Crosscutting a long board into smaller lengths. The board is held down on the top with a holdfast. A support under the free end would be good to have when cutting off a longer piece. 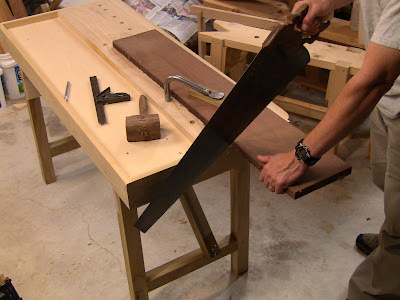 Ripping a piece to width, again with the board held down on the top with a holdfast. Just to have watch out for the frog. Jointing the rough ripped edge. The board end is caught by the frog, keeping the board upright and stopping it from moving forward, while the bottom edge is supported by the holdfast and a dog in the front skirt holes. This board is almost too thick to fit in the frog, so I may add a spacer to open it up. Jointing the face of a piece. 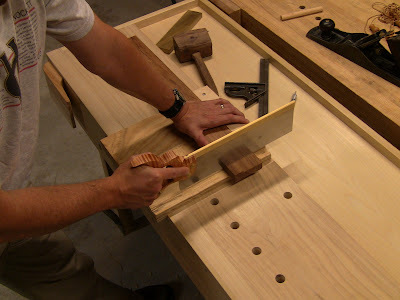 The board is stopped against the planing stop, which is raised enough to hold it in place without getting in the way. This takes a bit of practice to keep the board from sliding; you have to direct the plane toward the stop. 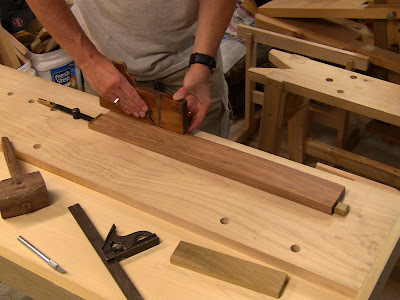 With the stop a little higher, jointing the edge of a piece. 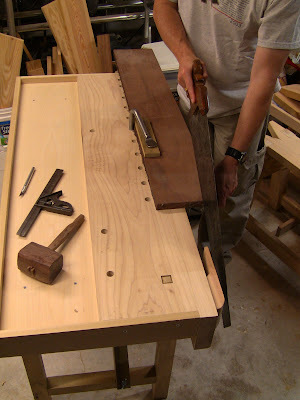 Traversing a board (going across the grain) with a jack plane to thin it down. The board is stopped against the planing battens, which have been inserted in their dog holes. 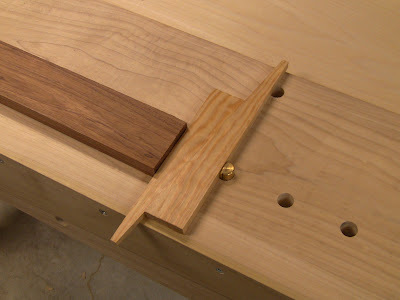 The short one uses the planing stop as part of its support. This setup allows very heavy work; you just have to direct the plane into the battens, slightly toward the corner. Planing along the grain. 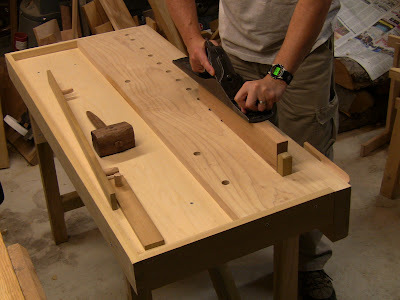 Use this setup if you have difficulty using the planing stop alone. Using a bench hook for precise cutting to length. Now that the pieces have been sized, it's time to cut joinery. Here's where the simple versatility shines. Cutting dovetails. The board is held upright agains the skirt in the frog, while the holdfast secures the other side. 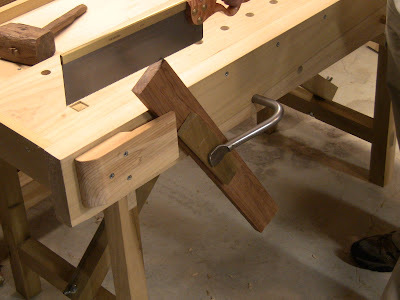 The extra bit of wood extends the reach of the holdfast and applies plenty of force (in fact, with the force applied by the holdfast past the middle of its length, the leverage is increased, like a sideways leg vise). It does take a bit of coordination to hold this all in place while bashing in the holdfast. Rabbeting an edge with a wooden rabbet plane. The board is held against the planing stop by a Veritas Wonder Dog in one of the dog holes. The holes have been spaced to be closer than the maximum extension of the Wonder Dog screw. These alternating wedges are the cheap, low-tech alternative to the Wonder Dog. 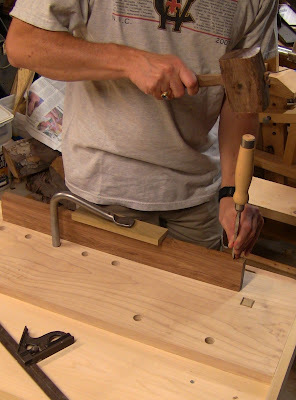 Hold one down while tapping the other in place with a mallet. They provide plenty of clamping force. An alternative setup using a wooden screw clamp and an 18" bar clamp. Another alternative setup. Clamps to hold clamps! You can see that with a few inexpensive accessories, you can hold your work for all kinds of operations. Anything you might want to do should be covered by one of these methods. Sure, large bench vises may hold with more force and may be a little simpler to adjust in some cases, but they add a lot of weight. Speaking of weight, the downside to a light bench is that it can slide around under the force of heavy work. This bench is small enough that you can brace your foot against a leg to hold it in place if necessary. You can also set a foot on one of the rails to hold it down. Here I'm bracing my right foot against the leg as I stretch my upper body to the left while planing. I call this move "Tai Chi with handplane." Ok, so maybe this is an awkward bit of workshop gymnastics, but you have to be flexible when working portable. Literally! Great bench and great post Steve. 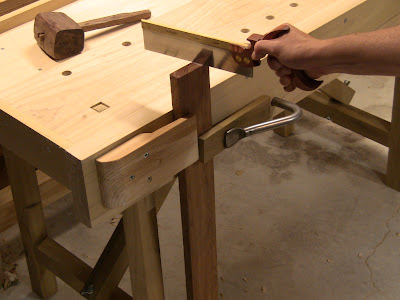 It's amazing what you can do without a vise. Love the set up for traversing. Really nice, versatile bench. Well done! Steve, portable or otherwise, THAT is a great bench. Looks like you thought of everything. Well done! Try putting some rubber drawer lining under the legs. That should help (a little) to keep the bench from sliding around. Thanks! I can't really claim credit for these, just standing on the shoulders of giants. I think this is the bench Roy uses in a number of his videos. 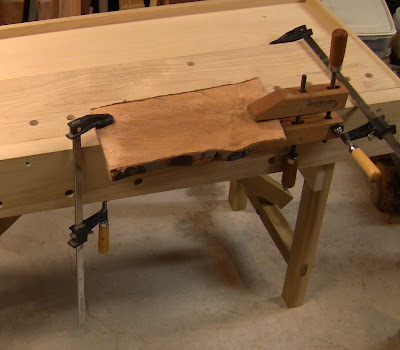 Most of the work-holding strategies are from Schwarz's Workbenches book, except the wedges, which I got from Harry Smalser on the Sawmill Creek forum (he's one of those guys who should be designated a national treasure). My one contribution to the party is putting pegs into the planing battens and drilling dedicated holes for them so they just slip into place for use. You can really beat on that setup with lots of planing force even though the workpiece is loose. No problem taking 1/8" thick shavings with an aggressive jack. The drawer lining is an excellent idea! Dealing with a slick or uneven floor is my one concern when I teach the class. My basement floor isn't perfectly flat, so I have to shim one leg of my Roubo. With the portable I can slide it around a bit to find the best spot, but at some point there's always some unevenness left to deal with. I've also been thinking of making little wooden slip-on feet that could have different thicknesses to deal with unevenness, or even extend the height a bit. These could have the drawer lining glued on the bottom permanently. 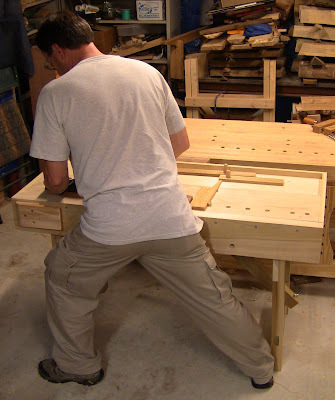 I too am an advocate of vise-less workbenches. I believe it helps one to listen to what the plane and other tools are telling us. 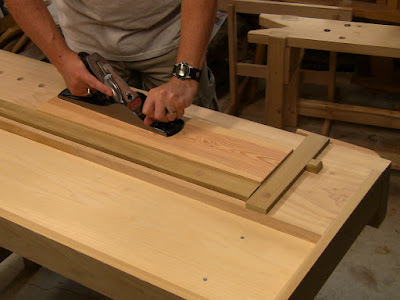 You might try using a piece of plywood on the floor with sockets or notches for two legs of the bench. You stand on the plywood and the bench stays put as you plane. It shouldn't need to be more than a couple of feet wide and a little longer than the bench. Thanks, Mike, I had been thinking of exactly that. Bought a quarter sheet of CDX for it. I was thinking about screwing some blocks to it that would then pin into the legs. Oops, a correction for my comment above, the name is Harry Strasil (not to be confused with Bob Smalser, who's also one of those national treasures over on Sawmill Creek!). I need to see this bench. For I want one badly. Not having a traveling bench is what limits me from demoing. So let me know if you can help with any suggestions. What does something like this weigh? I brought the bathroom scale down and stood the folded-up bench on end on it. The bench weighs 55 lbs. This is poplar, but pine (what Roy showed in his book) is similar in density, so would probably weigh about the same, maybe a few pounds lighter.